Modulex is the one stop solution for all your needs requiring aluminum door frames. 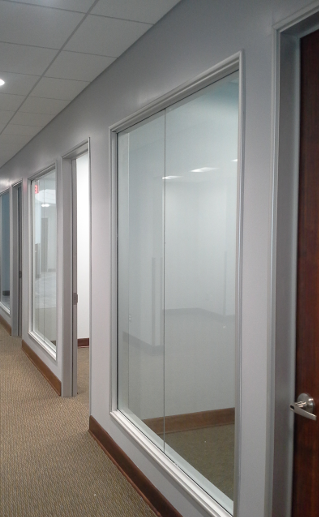 If you are a commercial interior designer our interior aluminum door frames guarantee ultimate customer satisfaction. Modulex frames are aesthetically pleasing, sturdy and help resolve installation challenges on the job. Our large inventory of products ensures we can meet most jobsite requirements with the best lead times in the industry. Just order units from Modulex and we transport your customized frame ready to install in the shortest time possible. Count on us, and our tailor made aluminum door frames will definitely help you to face even the toughest architectural challenges! Modulex door frames are the only Self-Mortising and Reversible frames on the market, offering clients unique flexibility when door and frame mismatches occur during installation. ATTRACTIVE: Frames can be tailored to multiple door styles. Wall sizes available: 3-3/4", 4-7/8", 5-1/4" & 7-1/4"
SMR® door frames can be ordered from the factory with hinges cut to user´s specifications. Simply specify hinge and strike locations when ordering. Modulex offers up to a 90-minute hollow metal frame with aluminum trim to create the look and feel of an aluminum finish. ADAPTABLE: Available in wall sizes 3-3/8" through 13"
The Delta Plus Series is not Self-Mortising and Reversible®.